This Lemon Garlic Slow Cooker Chicken Recipe is so simple yet so incredibly delicious. I’d hardly even call it a recipe! 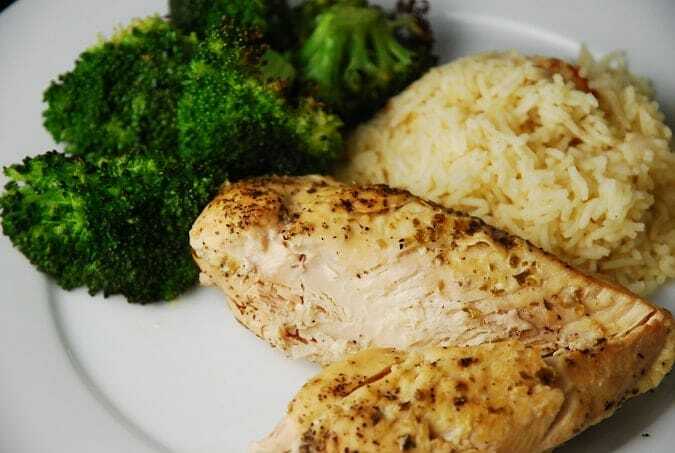 The preparation is so minimal and it requires just a few ingredients, yet the end result is a wonderfully moist and succulent chicken breast. It goes great when served over rice or roasted vegetables, or even on a sandwich. Strain some of the liquid leftover in the slow cooker and pour some over the chicken right before serving…it’s delicious! This is an excellent and incredibly easy Weight Watchers Slow Cooker Recipe that is a staple for when I have no time or energy to put into cooking but still want to serve something healthy, flavorful, and low in Points. Juicy, flavorful and incredibly easy, this low calorie Lemon Garlic Slow Cooker Chicken is a perfect weeknight dinner idea. With just a few basic ingredients and minimal prep work, this meal is a breeze to prepare and a pleasure to eat. Place half of the lemons and garlic in the bottom of the slow cooker. Season chicken breasts with salt, pepper and thyme and place on top of lemons and garlic. Cover chicken with remaining lemon slices and garlic, and pour broth over everything. Cover and cook on low about 4-6 hours, or until chicken is cooked through. Liquid from slow cooker can be strained and served over chicken. For all that is holy, do not use this recipe. I don’t cook with lemon often but now I know that three lemons is way too much. The chicken was inedible and had a horrible aftertaste. Maybe try with one lemon or half a lemon. I won’t be trying this recipe again even with less lemon. I’m scarred from lemon for a little while. This was the worst lemon chicken I have ever had…I felt like I was eating lemon dish soap. My suggestion is to cut the lemon to 1 sliced lemon and add a 1/4 of white wine. Made this last night and was very pleased! I used the recipe exactly as written, cooked 4 large chicken breasts for 6 hours on low with 3 lemons and the equivalent of 10 garlic cloves chopped. I also tossed in fresh thyme as well. Served with smashed potatoes and steamed veggies. Lemon wasn’t over bearing and flavor wasn’t bitter. I didn’t use the ‘sauce’, however. I will make this again but maybe reduce cooking by 1 hour. Thanks! I’m glad I read the comments before making this recipe. I used one lemon and chicken thighs instead of breasts & it’s pretty tasty. I served it over quinoa & kale to add some vegetable matter and I’m just obsessed with quinoa. This was super tart and I only used 2 lemons. I am wondering if maybe this was made with Meyer lemons. This was disgusting. We took one bite and threw it out. Gross! This was awful. Will never make this again. Made this with 2 chicken breasts , smells amazing and the chicken was very soft BUT bad idea to add whole lemons. My chicken had a bitter aftertaste which I am suspecting was due to the lemon pith. Would add lemon juice instead. I agree…this recipe didn’t turn out as I expected. The lemons were too much. If I try it again, I’ll just use 1 lemon…or possibly just the juice of one, as suggested. I do appreciate this website and what it offers. I do wish I had read the comments prior to making this dish. Thanks for your time and efforts with the website…I will continue to use it and refer others to it. I think this recipe might have worked better for me if I had just used the juice from the lemons. At a certain point the rind of the lemon made everything taste bitter -when I checked it the first few times, it still smelled bright and fresh… But then when the chicken was done, I noticed that it smelled bitter. I only used 2 lemons and it was pretty intense so for my taste, it could be cut back a little more. I love the idea of this recipe! Maybe adding the lemon slices later in the cooking process? worst recipe ever. Chicken was inedible. waste of money. Tried this after a disappointing experience with another lemon garlic chicken slow cooker recipe and took your advice (below) and cut back on the lemons- we loved it! Thank you for taking the time to share this with us, especially since it’s available to us for free. Your effort is much appreciated! I read the comments but tried this anyway. I love lemon, but I agree, this was way too lemony! It tasted bitter and was barely edible. I won’t make again either – sorry! Why not just cut down on the lemons instead of totally dismissing the entire recipe? i made this today and it was so juicy and flavorful! it smelled amazing when i opened the crock pot and my husband even commented when he got home. immediately after practically licking his plate clean, he states, “A plus, would eat again!” i guess we have a new staple! thank you!